Doing work around your house or doing construction work professionally requires you to have high-quality tools and that’s what a compound miter saw is. It’s a high-quality tool that allows you to get the cuts that you need for that next project without all the hard work. With this type of saw, you get precise angles and bevels for more specialized projects. This can be for any purpose, but if you had to do them with a standard saw they’d definitely be more difficult (if not impossible) to do. So, take a look first at the features of one to consider and then at the options we’ve found. Sliding: Does the saw slide or do you need to move it yourself? Sliding makes it easier to get to the position that you want and makes it easier to get the cut as well, but it’s not always a necessity for everyone. 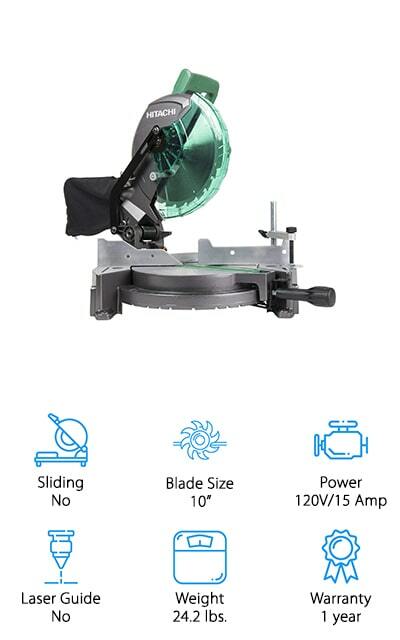 Blade Size: What size is the actual blade being used on the product? Larger blades can cut through bigger pieces or through different types of material. You want to make sure it’s prepared for what you want to cut. Power: How much power does the saw give you? This is going to affect what it’s able to cut and how easily. You want something capable of getting the job that you want done. Pay attention to power needs and abilities. Laser Guide: A laser guide makes it easier for you to follow the line that you want. It’s not always a necessity, it’s more of a personal preference, but it’s something you want to take a look at before you buy. Weight: How much does the saw weigh? You won’t need to hold it the way you will with some other saw options, but you want it to be easy to transport if needed. Don’t get something too big or bulky for your needs. Warranty: How long is the warranty? A warranty means that the company stands behind their product. A longer warranty means that you can count on the product to last longer and the company’s support if it doesn’t. You want a compound miter saw that’s going to get the job done right and fast, every time. That means you’re going to need a little bit of information about the options, right? Well, we’ve already gone through some of the important features. Now we’re going to go over the top options when it comes to a compound miter saw. That’s right, we’ve done the work for you and found some great choices that can make sure each project that you create turns out just the way you want, with no problems in between. 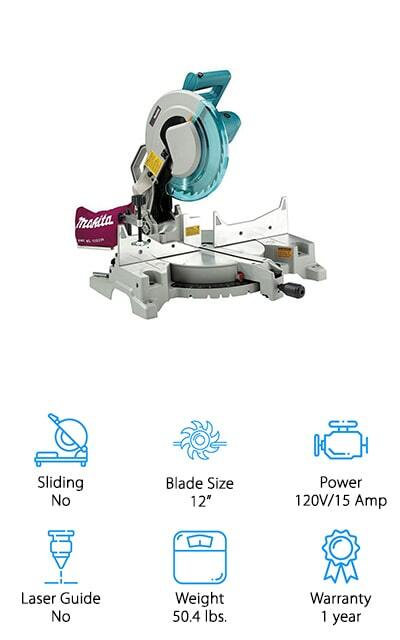 If you want the best compound miter saw sliding this is what you’re going to want. It’s made by a company that’s well known for high-quality tools and it offers you all the extra features that you’re going to want. 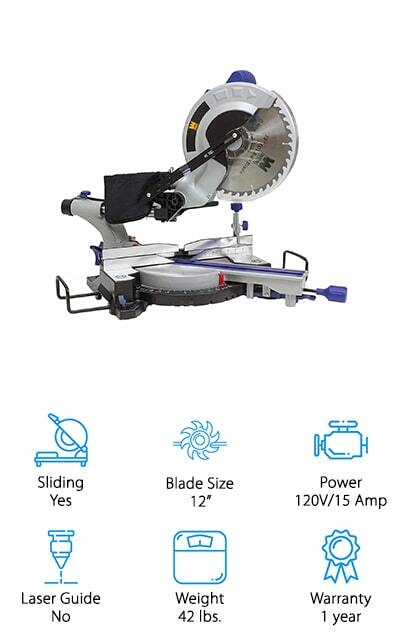 This miter saw has a dual bevel and axial glide. Because of that, you’re going to get precision and you’re going to maintain the control that you need to get the job done right. 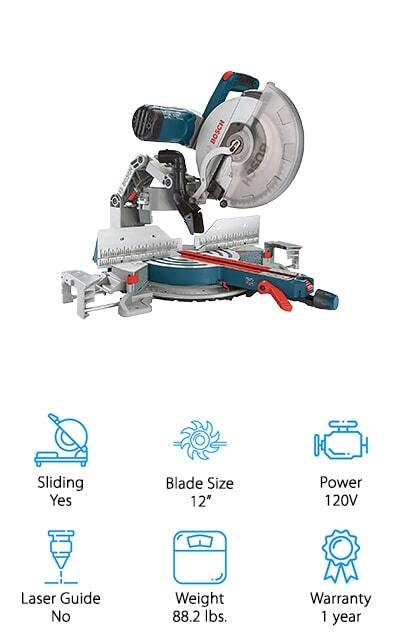 The 14” horizontal cutting capacity and the 6 ½” vertical and crown capacity make this system great for a variety of different projects and make sure you’re ready to go. You get easy to adjust pieces as well as easy to read bevels and miter scales that make it simple to get the job done the way you want it. You’ll also be able to use the trigger handle whether you are right or left handed. You want to always have the best compound sliding miter saw and we may have found it with our budget pick. This system gives you up to a 52° miter angle range either to the left or the right. It also gives you up to a 45° bevel range on the left, which means you’ll be able to make the bevel cuts that you’re looking for with high levels of accuracy. When you’re looking for the positive stops you’ll have more than just line of sight, you’ll have thumb actuated spots to make the adjustments a whole lot easier. 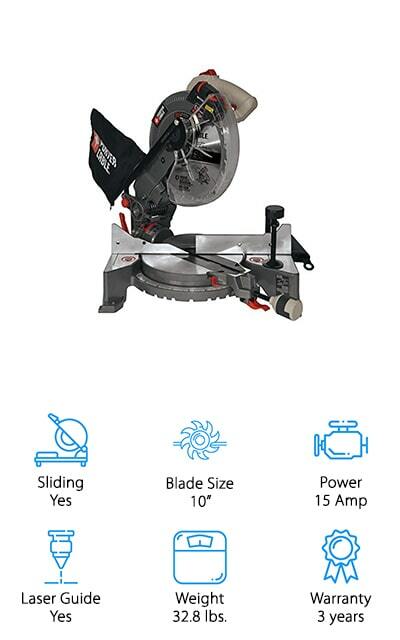 You get a 1-year warranty and a 10” blade alongside the 15-amp motor. All of that means you’re going to have the power you need to cut through anything and you’ll easily be able to get the right angles and sizes for the next job. 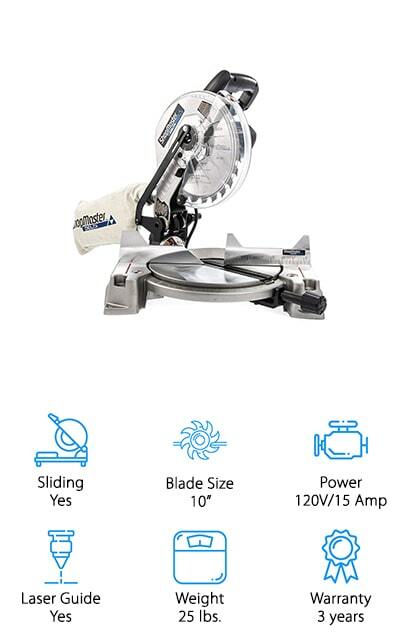 While this may not be the best double bevel compound miter saw, it is a great option that’s going to give you high quality and plenty of features. It offers a 15-amp motor that provides up to 3,800 rotations per minute to get through just about anything. The 12” blade definitely helps with that process as well and makes sure you have something durable. You get a back fence design that can cut up to a 2 x 12 piece of wood and at a 90° angle. That’s definitely going to give you some options when it comes to the projects you want to complete. The dust collection system is even designed to collect the dust that is generated, up to 75% of it, which means your work area is going to stay a whole lot cleaner. On top of all of that, you’re going to have a 3-year warranty that lets you know this tool is designed to work the way you expect. 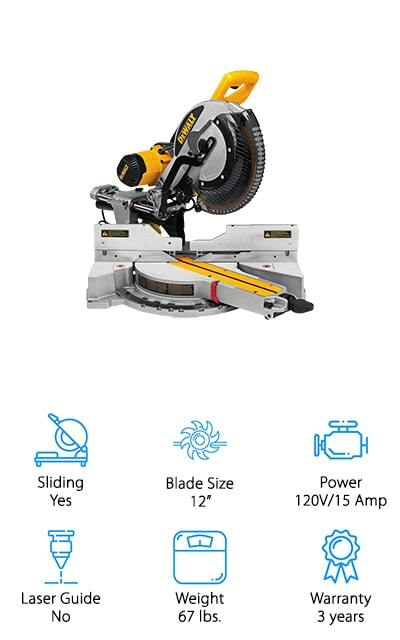 This compound miter saw is going to give you up to 4,000 rotations per minute, so you get the power and strength that you’re looking for with the 12” blade. It’s able to cut, with the 4 ½” pivoting fence, 5 ½” crown molding a whole lot more. It’s also going to give you 9 different settings for different angles both to the right and left, so you can make sure your next project goes off without a hitch. The carbide tips on the blade are also great for precision and help the blade get through anything. You’ll have an electric brake, a pivoting fence makes sure it’s ready for the largest pieces you want to cut and the safety shield makes sure that no one is going to get hurt when you’re not working either. It even comes with a 1-year warranty that lets you know it’s ready to run. You might not be getting the best dual bevel sliding compound miter saw with this option, which gives you a bevel to the left but not so much to the right. You’re getting a spindle lock that keeps the spindle right where it should be and you’re getting cutting angles of up to 47°. The 10” blade means that you have enough power, strength and a whole lot more to really get deep into any piece, whether you’re cutting through thick pieces of wood or something else entirely. This system gives you a laser guide that makes sure you’re cutting right where you want to every time. Not only that but you’re going to have a lighter weight system that’s easier for you to move when you want to take it with you somewhere new. Here is one of the best rated compound miter saw options we’ve found, and it comes with a whole lot of features. You’re going to get a 12” blade that can cut through just about anything, but especially any type of wood you put in front of it. You’ll also have a motor that gets up to 120 volts and 15 amps as well as a laser guide that makes sure you’re cutting right where you want to be every single time. That’s going to keep you moving forward a whole lot easier, no matter what the task. The system is designed to make things even easier for you and the fact that it can get up to a 45° cut makes it even more versatile. You get an ergonomic sliding rail and you’ll have a comfortable handle that makes it easy to use. 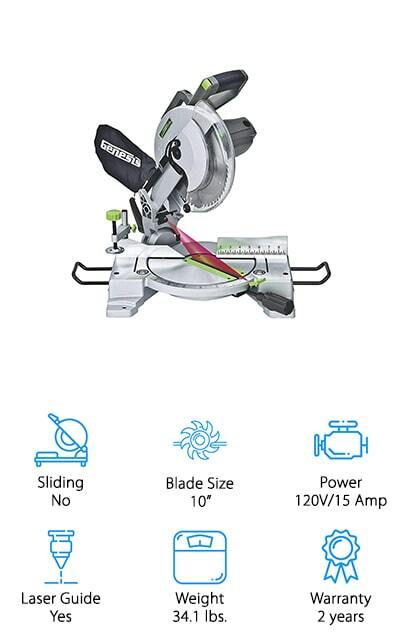 If you want the best compound miter saw this is one you definitely want to look at because it’s made by a company that’s well known for high-quality tools. 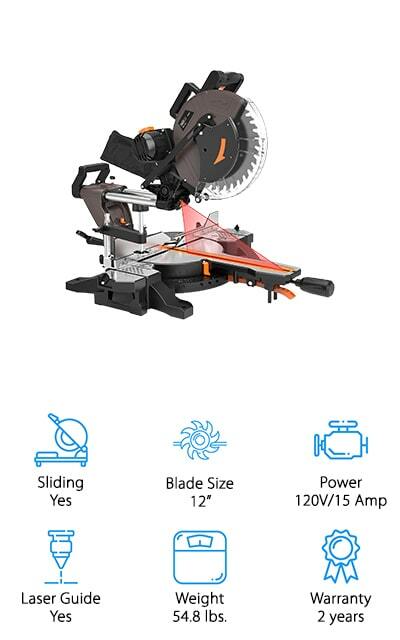 It comes with a 10” blade that can get you through just about any type of wood and it has a 120-volt, 15-amp motor that’s powerful enough to make sure you can work through quickly as well. You’re getting a laser guide and a sliding rail that makes it easier than ever to get all the adjustments you need and make sure you’re cutting along the right line. This single bevel system even comes with a 1-year warranty so you know you’re getting a high quality and high durability unit. The lightweight nature of the tool even means that you can move it around whenever you want. 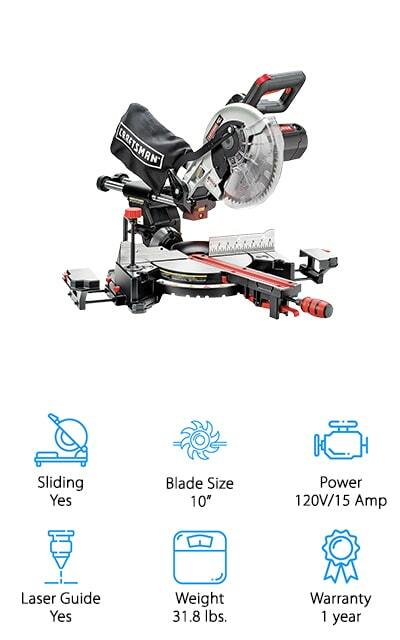 When you want the best sliding compound miter saw this isn’t quite where you want to look first but it’s going to be a great quality miter saw just the same. This non-sliding option does give you a 10” blade that’s ideal for cutting through most wood projects and it gives you the bevel cuts you need on both sides, up to 45°. There are 9 positive miter stops to choose from and you’ll have a laser level that makes sure you’re cutting along the line you want to. With this system, you’ll also get a 2-year warranty and you’re getting a powerful enough motor that you can make sure you’re getting a clean and efficient cut every time. The lightweight nature of the saw also makes it a lot easier for you to move as needed. This system is definitely going to be unique for a number of reasons. The most interesting is that it actually folds to make it easier for you to transport whenever and wherever you might want. The saw itself is lightweight and it’s a sliding option, giving you even more versatility and capability. It doesn’t require tools to adjust the laser at the front and instead provides you with the quality and features you need to make sure you’re cutting right where you planned to. The 10” blade is efficient for most wood projects and the bevel to the left as well as miter to the left and right means that you can get whatever cut you may need. You’ll be able to get through even larger pieces of wood at just the right angle. With this compound miter saw you’re getting a sliding rail that makes it even simpler to get right where you want. You get a 12” blade that can cut through most pieces of wood and just about anything else you might need. On top of that, you have a motor that’s 120 volts and 15 amps to provide you with the power that goes along with that blade. This saw gives you plenty of bevel options to both the left and the right and it has 9 positive stops that make it convenient for you. You’re going to have a strong and durable blade as well as a high-quality dust bag that helps you keep your space a whole lot cleaner and ready for the next project. Not only that but support fences and workpiece extensions keep your project where you want it while you cut.